2933 S. Ponte Vedra Blvd. This beach is an ideal spot for picnics and beachcombing excursions. A one-stop shop for bicycle needs. This campground with cabins, tent sites, and RV sites is just a one mile walk from St. Augustine Beach. Backwater Tour Company is based in Daytona Beach, but offers inshore guiding services throughout the St. Augustine area. Soar high above the city of St. Augustine with these scenic plane tours that offer a bird's eye view of the city and Florida landscape. St. Augustine Fishing Charters has a fleet of 20 ships for all your fishing needs! St. Augustine Paddle Sports provides equipment and tours for paddle sports. They offer kayak tours, paddleboard tours, rentals, paddleboard charters, and more. The shop also is a one-stop-shop for fishing gear, bait, tackle, and apparel. Visitors can take in St. Augustine's sights from great heights at St. Augustine Parasail. St. Augustine RV Park offers extended stay options for RV campers. 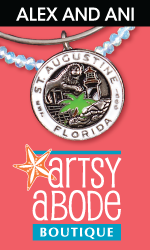 St. Augustine's brand-new venue and marine community is located on the San Sebastian River in the heart of downtown. Learn to surf in St. Augustine! Take a water taxi to marinas, piers, and restaurants around St. Augustine, check the profile for dates and times. This pier offers activities and access to the main beach that visitors and residents alike frequent. Located near beachside restaurants, shops and more.